The SIMCJOH project has been developed under leadership of Simulation Team DIME University of Genoa, in partnership with MSC-LES, Cal-Tek MAST, Finmeccanica Land and Naval Defence Electronics Division, CAE. 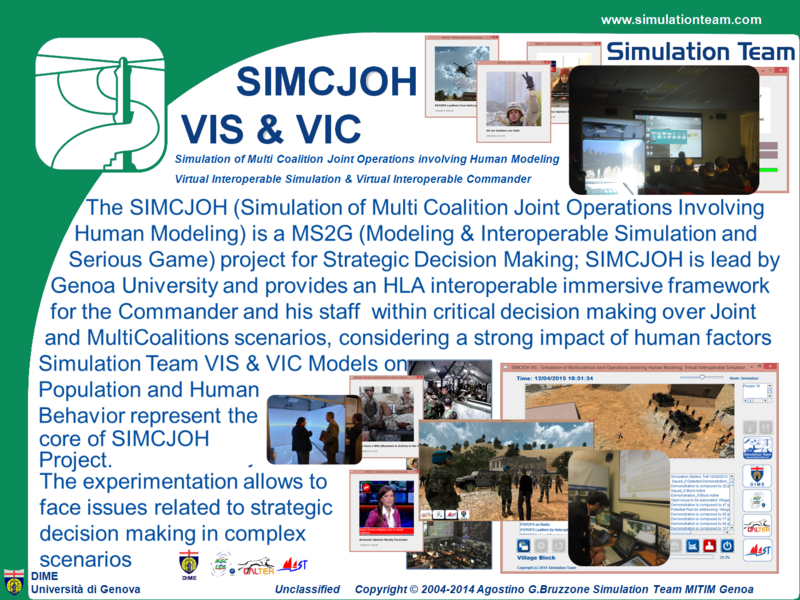 SIMCJOH Simulation and Federation core is composed by SIMCJOH VIS & VIC developed by Simulation Team ( DIME, MSC-LES, Cal-Tek and MAST ) and reproducing MEL/MIL (Master Event List, Master Incident List), COAs (Courses of Actions) and HBM (Human Behavior Models) using stochastic simulation and IA (Intelligent Agents) based on Simulation Team IA-CGF; the SIMCJOH HLA Federation includes also Finmeccanica SGA / NCS and CAE GESI. On 28 January at the M&S COE, in De Cicco Infrastructure, Rome, it was officially interactively presented and edemonstrated the SIMCJOH (Simulation of Multi Coalition Joint Operations Involving Human modeling) Project and Simulator (Project of National Military Relevance). SIMCJOH simulator faced a PSO operational scenario, where decisions of the Commander require to consider the impact of Human Behavior Factors being affected, in the specific geopolitical context, both to reaction of the local "population", "domestic opinion" and action lines of "Opposing Forces ". In this context, the Commander interacts dynamically with SIMCJOH simulation to ensure the success of the mission in respect of mandate and ROE as well as limiting as much as possible any collateral damages and second effects. The Meeting opened by the welcome of the M&S COE Director, Captain Vincenzo Milano, followed by a summary on the Military Relevance of the human behavior simulation in current operational scenarios provided by Lt.Col.Paolo di Bella. An introductive presentation on the Geo Polical Situation included in SIMCJOH Models was provided by Dr.Marina Calculli of George Washington University. Prof.Agostino Bruzzone, Full Professor at the Polytechnic School of Genoa University and SIMCJOH Project Manager, presented an Executive Summary of the project SIMCJOH describing Conceptual Models, Behavioral Patterns as well as the Logic of the Intelligent Agents that represent the core of the Simulator. The presentation was completed by a first set of interactive demonstrations obtained by running interactively the scenario adopting different COAs. After this phase the Meeting evolved into an open discussion followed by the direct and interactive experimentation and testing by attendees on the simulator SIMCJOH VIS & VIC (Virtual Simulation & Virtual Interoperable Interoperable Commander) integrated with SGA and NCS were demonstrated fully Federated in HLA as well as in basic stand alone mode for Commander mobile training. During the demonstration of SIMCJOH showed widespread interest both to further developments a new MEL/MIL or Scenario developments as well as to be integrated in Education and Training programs and Italian MoD Initiatives. During the event, the Simulation Team on the Universities of Genoa (DIME) and Calabria (MSC-LED), as leaders of the consortium that developed the project SIMCJOH and as Institutions with which the Centre has gained solid experience in technical and scientific cooperation, have offered an opportunity to experience directly a wide range of Simulation products and their interoperability capabilities in HLA. Indeed it was presended and demonstrated, among the others, the following list of simulators: MALICIA (Model of Advanced Planner for Interoperable Computer Interactive Simulation), IDRASS (Immersive Disaster Relief and Autonomous System Simulation), IA-CGF (Intelligent Agent Computer Generated Forces), UCOIN (UAVs for intelligence agents and counter- Insurgency), Cyber Warfare Simulation, CBRN Simulation, etc. Simulation Team dimostrated also other Simulators and Systems devoted to support planning and logistics through interoperable simulation and proprietary LVC solutions as the Interactive and Immersive CAVE SPIDER (Simulation Practical Immersive Dynamic Environment for Reengineering), different combined solutions of Virtual Reality Helmets and Smart Glasses for technology "Augmented Reality" integrated with the software and Outside Real SOPHOS (Personal Assistant and Knowledge Navigator by Voice).